GC, BW, NW Dovon Simon the Possumm of Lynzkatz is CFA's Fourth Best Cat in Championship for the 2012-2013 show season. 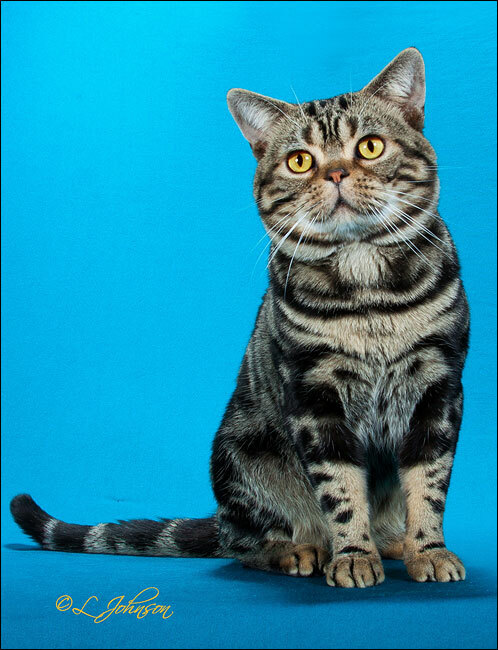 This American Shorthair boy, affectionately known as Possumm, represents the unusual partnership of breeders located in Pennsylvania, Florida and Hong Kong. This is his story . . .
Possumm's story begins several years ago. Kathie and Doug Von Aswege from Florida were returning to CFA and the breeding and showing of cats after a long hiatus. 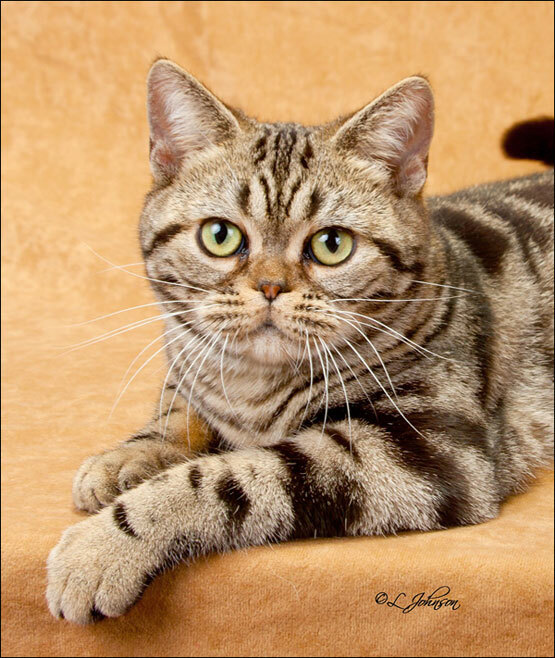 Kathie had previously shown British Shorthairs while Doug had shown American Shorthairs in the '90s. Once married, other things in their life took priority so they stopped breeding cats for a time. When they decided to get back into the cat fancy, they chose to concentrate on American Shorthairs, breeding under the Dovon cattery name. The Von Asweges contacted Linda and Jon Bartley of Lynzkatz in Pennsylvania. 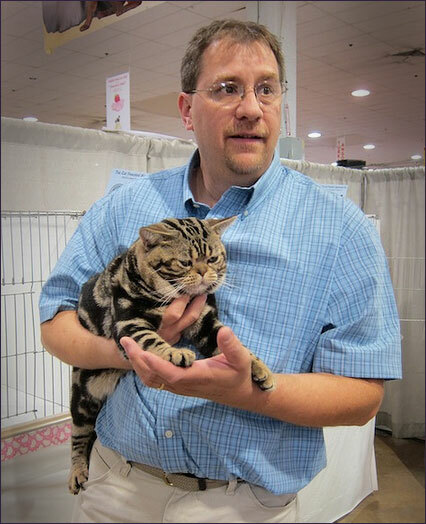 The Bartleys have been breeding and showing American Shorthairs since 1987, and have also shown Exotics in the kitten and premiership classes. Linda has been a licensed clerk for more than 25 years and the secretary of the National American Shorthair Club for the last 5 years. 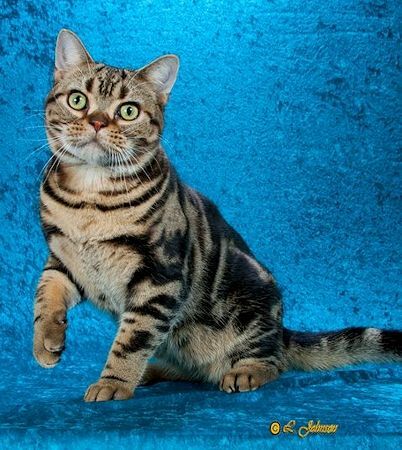 The Von Asweges purchased several cats from the Bartleys including a young female brown tabby who would eventually become CH Lynzkatz Cognac Diamond of Dovon, DM. GC, BW, NW Yatfung Hulk in Brown!!! (The three exclamation marks are part of his registered name). Possumm's Sire: GC, BW, NW Yatfung Hulk in Brown!!! For five years, Kathie and Doug, Linda and Jon, Edmund, Christine and Christine have worked together. In that time, their working partnership has produced five National Winners, countless Regional Winners and Grand Champions, several Lynzkatz DMs and, perhaps most importantly, a group of friends that is an extended family for everyone involved. 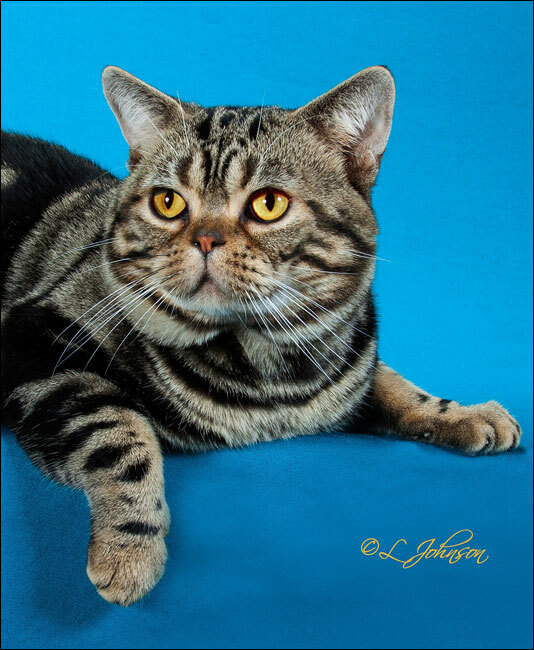 In 2011-2012 show season, the Bartleys showed GC, NW Dovon Clark of Lynzkatz to 18th Best Kitten in CFA. 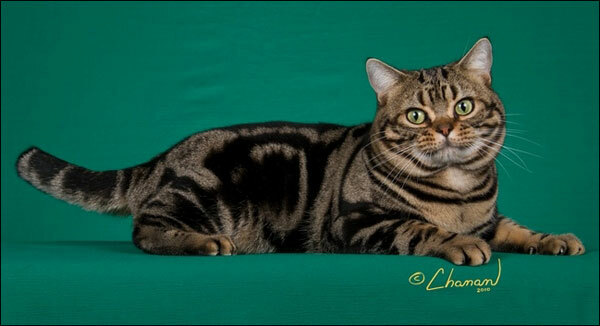 When Clark moved on to show in the championship classes, Kathie asked the Bartleys if they would like to show Clark's young half-brother, first as a kitten — and then grand him once he aged out. 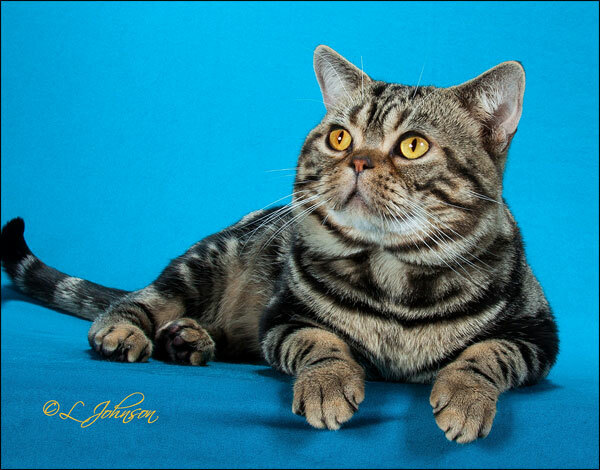 The kitten's mother, CH Lynzkatz Cognac Diamond, had already produced siblings GC, GP, RW Dovon Sylvestor the Cat of Yash and GC, RW Dovon Sallee in Brown of Janvier, so Kathie wanted to finish the kitten to add another grand to Cognac's total offspring granded in CFA. The Bartleys were happy to show the kitten for Kathie. Kathie had named the kitten Dovon Simon the Possumm. 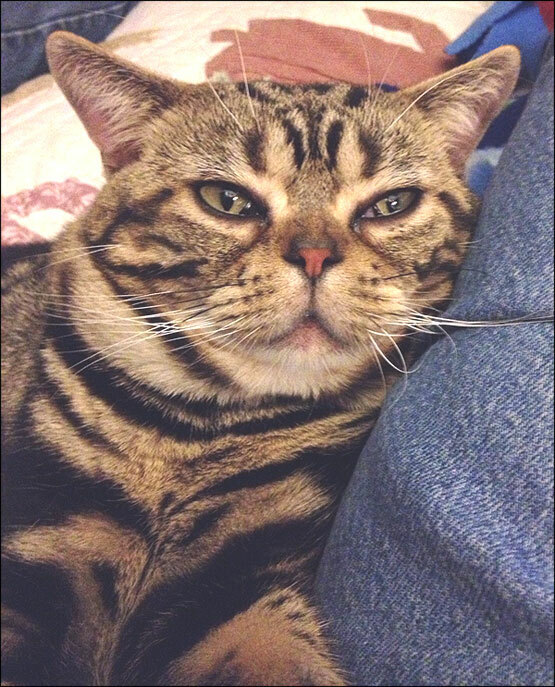 You may think this is an unusual name for a cat, but he is actually named after a character in a best-selling series of mystery novels written by Rita Mae Brown and co-authored by a feline named Sneaky Pie Brown. The main character in the series is Mary Minor “Harry” Haristeen, who has three cats. One of the cats, Mrs. Murphy, is the tabby who actually solves most of the crimes. Simon the Possum lives in Harry's barn and is friends with Mrs. Murphy. So that is how an American Shorthair kitten came to be called Possumm. In February 2012, Linda and Jon met Kathie at a Columbus hotel to pick up Possumm. When they walked into the room and saw him for the first time, Linda smiled at Kathie and said, "I hope you know he isn't coming back when we are done showing him!" The Bartleys had fallen instantly in love. Possumm looked like their Lynzkatz cats. With only a few weeks left in his kitten career, there was no chance for a kitten campaign, but Possumm was still very competitive, making many finals including Best Kitten wins. This seemed to bode well for his show potential as an adult. Once Possumm turned eight months old, he was off to show in the Championship class. He went to Baltimore's Crab and Mallet show in March as an Open and made the finals. He followed it up with granding the first day at the Western Pennsylvania Cat Fanciers show, making all but one final at that show. But the 2011-2012 show season was nearing its end. The Bartleys had just campaigned two cats to National Wins. They were ready to take it easy for a bit. They decided to wait until the new season started and then see what the future might hold. While they were waiting, Possumm kicked back and relaxed . . . and just kept looking better and better and better. Possumm has a beautiful head with a broad square muzzle that is not too short, so he was not considered too extreme or too moderate. He has a wonderful hard coat and a painted on pattern with a warm brown ground color. Beyond his physical beauty, he had a look and a presence that sets him apart. You notice him right away. 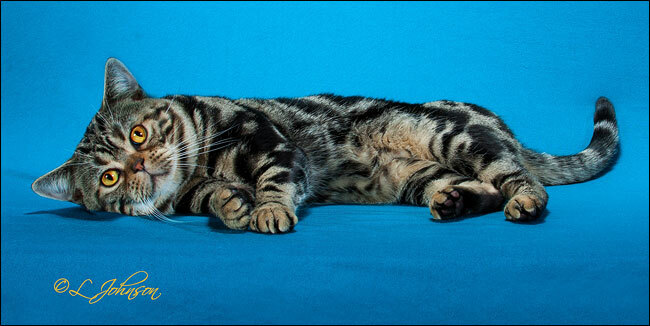 As he approached his first birthday, he represented everything an American Shorthair should be. Linda and Jon brought Possumm out to the shows at the end of May 2012 and he immediately started collecting Best Cat rosettes. He was Best in Show at the big Colonial Annapolis show and again at the Great Lakes Regional in June. The Best In Shows continued to pile up including the Diamond State and National Birman Fanciers shows. The Bartleys decided to see how Possumm would do at the biggest show of the summer — Garden State. He had a great show with all 8 finals and was twice chosen as Best Cat! They were now officially on the campaign trail . . . The decision had been made. They would run him for a National Win. Possumm loved the weekends in the hotel room. 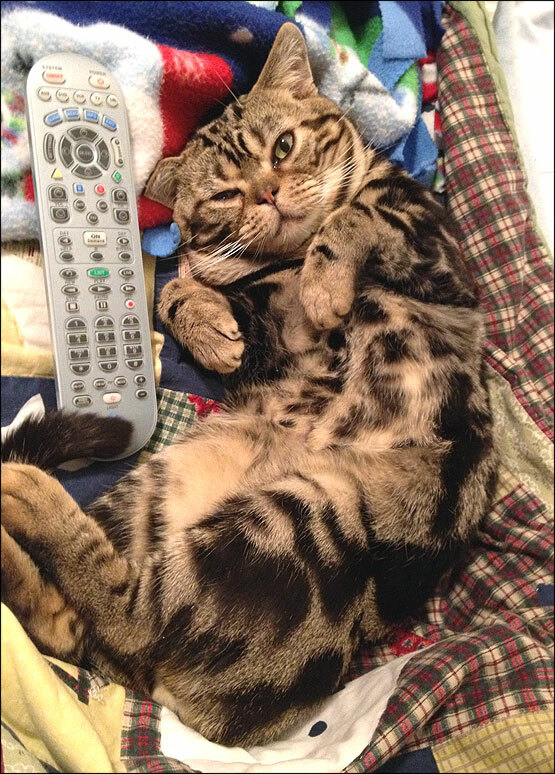 His favorite times were when he would jump up on the bed in the evenings and snuggle with Linda and Jon as they watched TV. 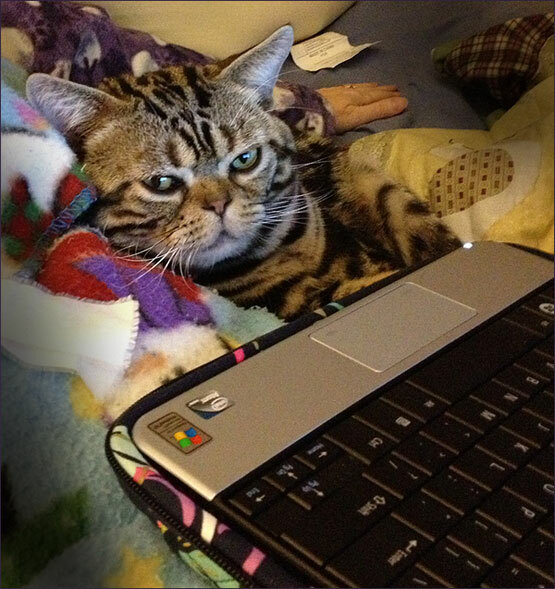 Even though Jon is definitely his favorite person, Possumm seemed fascinated by Linda working on her laptop, and would watch her tapping away for hours. Possumm deciding which TV program to watch next . . .
Possumm supervising Linda as she works on her laptop . . .
Possumm was a great traveler and always enjoyed the shows. It was Jon who always took him up to the ring. When the judge brought Possumm out onto the table, he would play with abandon. Occasionally he would "fall" off to take a little walk to the exhibitor benching area, giving Jon and the judges quite a scare. It never fazed Possumm. He was a level headed guy. He knew he could handle any situation. He was also a bit of a flirt. He liked to call to the girls at the shows. The only problem is that he has a high pitched voice that is totally unexpected coming from such a macho-looking, husky American Shorthair. The other exhibitors couldn't help but laugh when he vocalized. He particularly liked to try to smooth-talk the Cornish Rex and Sphynx girls. The Bartleys told him he'd have to forget any ideas he had about a liaison with those breeds. Possumm zoomed up the national standings and by August he was #1 in the Championship. He had three judges that never made him lower than Best Cat; Gary Veach, Lorraine Rivard and Bob Molino. He also had many judges that used him every time they saw him and were totally supportive of his run for a NW. The biggest show in CFA is the World Show, held in November. It has an unusual format. There are actually two separate shows running concurrently on the weekend. A cat can only compete in one of the shows. 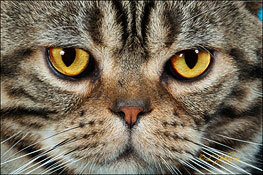 In 2012, a total of 787 cats competed over the weekend representing 41 breeds. The unique part of the competition is that at the end of the show, kittens and adults are shown against one another in the final to choose a single cat that is crowned Best of the Best. Possumm made all 8 out of 10 finals and was Second Best Shorthair in the Best of the Best judging! 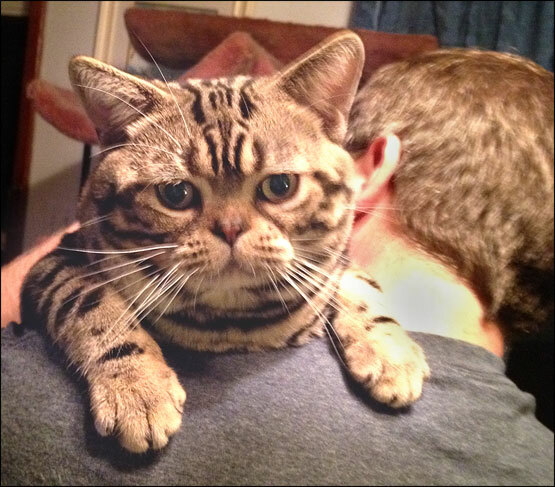 Possumm remained at #1 in Championship until the end of January when a beautiful Exotic Shorthair passed him to claim the top spot. 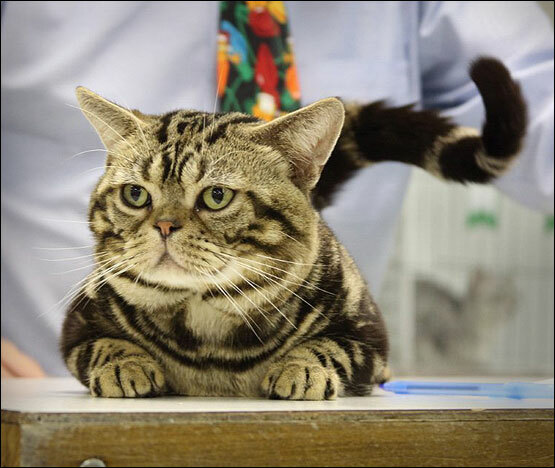 He ended the season as Fourth Best Cat In Championship, following in his father's footsteps while finishing one placement higher. 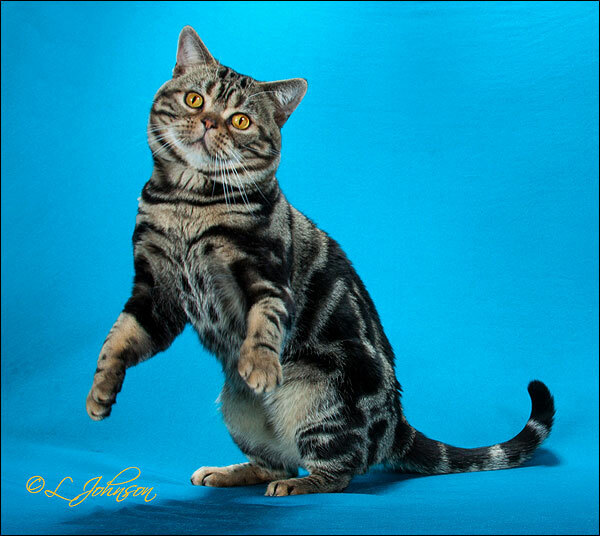 Now officially GC, BW, NW Dovon Simon the Possumm of Lynzkatz, he was also Best Cat in the Great Lakes Region and Best American Shorthair in CFA for 2012-2013. Possumm is now retired from the show ring. He will miss the time he spent in the hotel rooms on the campaign trail and especially the show moments with Jon. While Possumm will always be his daddy's boy, he will soon become a daddy himself. Possumm is now making future dates with the girls (no Cornish Rex or Sphynx girls need apply). 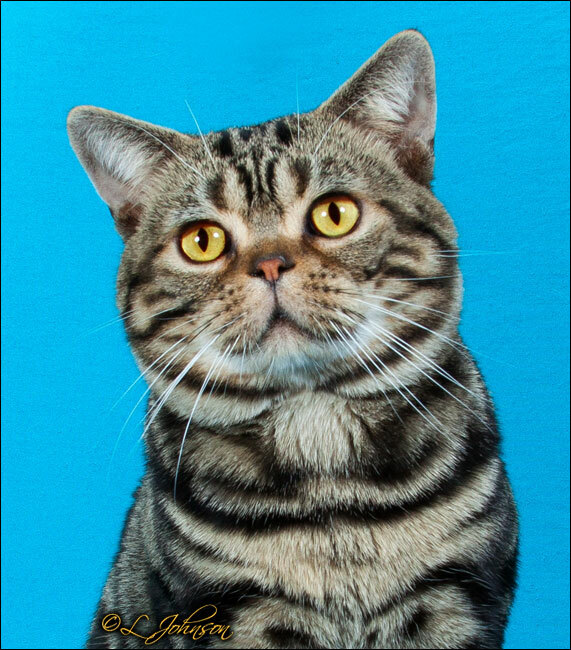 The Bartleys are looking forward to having his American Shorthair babies to show in the future. Perhaps there will be a Baby Possumm at the shows one of these days. Sire: GC, BW, NW Yatfung Hulk in Brown!!! Possumm is a Daddy's Boy . 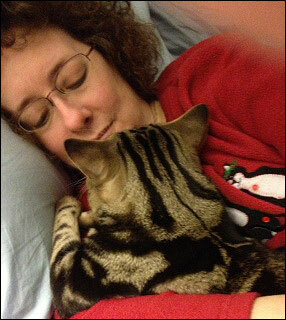 . .
Snuggling with Linda . . .
Possumm riding his "dad's" shoulder . . .
Possumm on the judging table . . . Relaxing on the sofa back home . . .